Robert Babicz is a German-based Polish producer and DJ whose work over the past few decades is unparalleled. With over 1000 releases, his dedication to the craft began early and we wanted to find out more about his start. He's provided us with a mix for Night Rumours 46 and revealed a few secrets with us in our interview, including his very first studio setup, his current favourite studio pieces and the reason he wears that eye-catching red scarf. 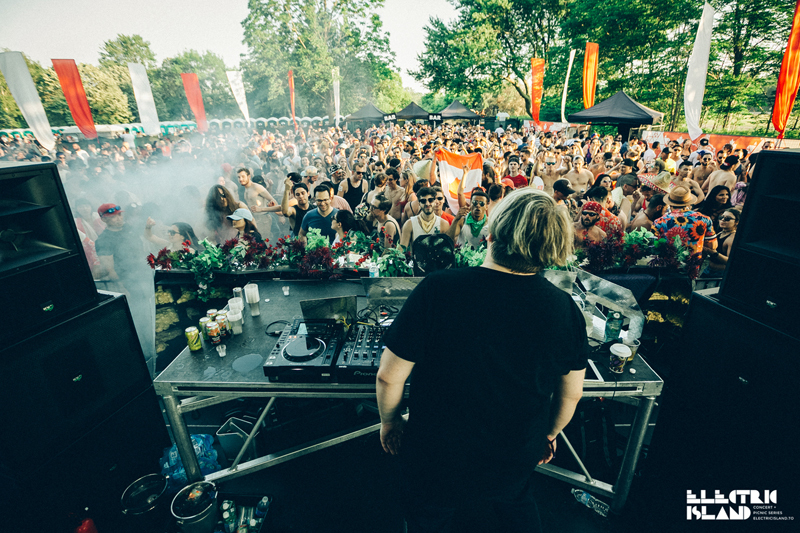 We caught up with him and got to check out his impressive set at Electric Island this past weekend. Read on below. We sat down with Robert Babicz last week to chat about a few things ahead of his performance at Electric Island in Toronto this past weekend. Witnessing his control over a crowd during a 3+ hour set was a testament to his craft and workmanship over the years. His versatility shows through at every track selection, but his flawless mixing and consistent sound has made him a favourite here and around the world. When asked about his early days and the original studio setup he started with, Robert mentions "My very first steps were made on a commodore amiga home computer, then my first records were done on a friend's setup that he lent to me, tr909 tr606 tb303. Very basic techno machines." The Commodore Amiga home computer may not have lasted the test of time but the other machines he mentioned were just that, very basic techno machines which still to this day are commonly used and sampled. Similarly, he uses some old school analog synths but has clearly embraced the technological innovations that come along with new products these days. "I still love the classic machines, but on a regular studio session I love my NI BATTERY because I sample and prepare my own sounds there. And synth? That's not really easy to answer, because it's changing almost on a daily basis. But I often use the Elektron analog keys for main elements in my songs, or the Moog mother or a sh101. And of course, there are many really great plugin synths as well." The changing sound of modern electronic music goes hand in hand with changes in technology that has allowed new sounds to be created. Robert has no doubt seen this first hand, and his approach is all about embracing it – "It's changing all the time, I've been doing music for 28 years, and I saw and still see an evolution. But I am not that black&white. I combine old school workflows with modern workflows. It all depends on the song I am working on." As like the technology and approaches to creating music, listening to and selecting music is another always changing process. Whether new or old, a song and it's creation can have an important meaning. When asked about an artist that currently inspires Robert these days, his response was "Right now, I get a lot of inspiration from artists like JJ Cale , the way the instruments were played and the mixdown are out of this world, especially the old works from the 70s." Clearly, timing doesn't matter when it comes to music, and the mention of JJ Cale, a legendary guitarist who worked with Tom Petty and others, goes to show Robert's ear doesn't strictly stick to house and techno. If you've seen Robert Babicz on stage (unless of course it's sweltering heat like this past weekend in Toronto), chances are you've seen his red scarf wrapped around his neck. I had to ask him the meaning behind this and his answer was this, "The red scarf is my superman cape, when I put it on I change from the private Robert to the artist Robert. It gives me kind of security. And the exact colour is a magical frequency." We appreciate Robert taking the time to talk with us and if you're able to catch a set from the man in a city near you, we highly advise.